We have welcomed guests to our award-winning Bed and Breakfast since fall, 2000. We are now concentrating our efforts in growing blueberries and Christmas trees, and we take guests at the B&B by special request on a very limited basis. 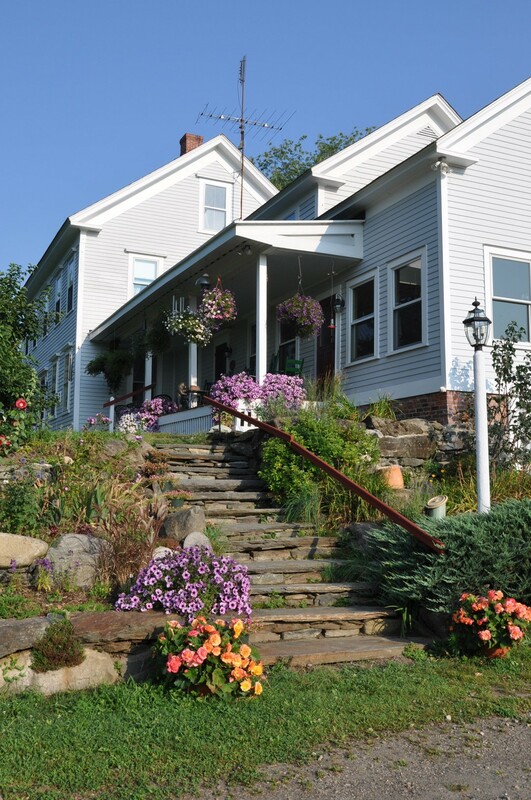 We converted the historic 1877 farmhouse into three lovely guest rooms, each with private bath, filled with antique furniture and original artwork. Each room has a queen or king size bed, and we can accommodate up to six guests. Our living room, with its gas fireplace, provides a refined, but comfortable, place to relax. Breakfast in the dining room has been the highlight of many guests’ visits, as they share our multi-course homemade breakfasts, and convivial conversations. Because we grow our own berries, breakfast almost always uses our own fruit somewhere on the menu. 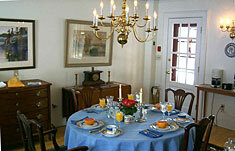 Breakfasts include juice, fresh fruit, and Susan’s home-made bread and muffins. Our entrees, sweet or savory, are a team effort, but always beautifully presented by Larry. We provide homemade granola, applesauce from Apex Orchards apples, and perhaps rhubarb sauce, and yogurt, so we’re sure nobody leaves the table hungry. We hope you will try some of our Bed and Breakfast recipe favorites at home. Our farm encompasses 160 acres of grasslands and woodlands along with berry and Christmas tree fields. Allen Brook makes its way through the front fields and drops down one of the deepest gorges in Massachusetts to join the Green River in Greenfield. Guests are encouraged to enjoy our beautiful surroundings and explore our undeveloped acres, or to relax in a hammock or a rocking chair on our front porch and watch the hummingbirds as they come to the feeder. We now take guests at the B&B on a very limited basis. We welcome returning guests who have stayed with us before, and will try to accommodate folks who are visiting families in our area, or who have a special reason for wanting to stay with us. A two night minimum stay is always required. Please contact us for information on availability.